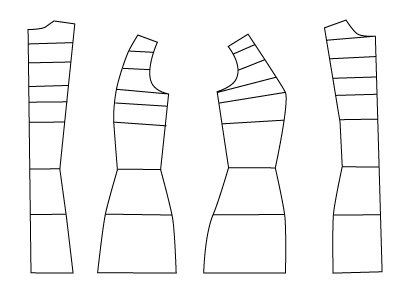 If you have done up a torso draft with my sneaky mathless draft, you might be wondering how to turn that into a normal block with ease… Maybe even something that’s not a princess line, like a 1 dart bodice block, so you can do some dart manipulation. These instructions should work for any easeless princess line draft, so if you have a moulage or some such lying around, you’re good to go. Pardon the cheesy Illustrator graphics. My sewing table is currently covered in 2x4s because, um, reasons. 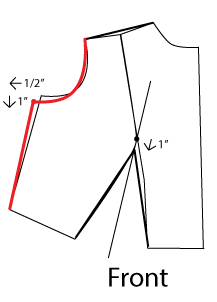 Copy off the CB, SB, SF, and CF pieces above the waist line. Rotate the SB and SF pieces so that they line up with the upper CB and CF pieces. 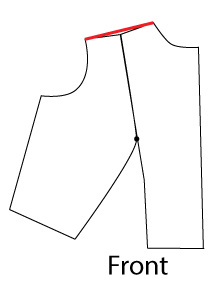 The backs will match across the fullness of the shoulder, but not above nor below. Shoulders are tricksy little beasts like that. In Back, true a line square to center back along your shoulder width guide. This will be your Horizontal Balance Line. In Front, mark the Bust Point on the bust line where the CF and SF meet. We’re going to put a dart in the back shoulder. 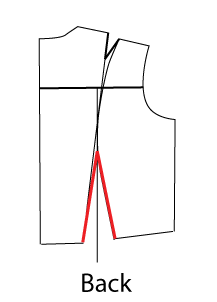 It follows the edge of the CB piece down to the neck guideline, the connects to the inside corner of the SB shoulder. After this point, we’re not going to be using our horizontal guides. I’m erasing them to clean things up a little. In back, draw a guide square to the HBL, passing through the center of the proto-dart area between the CF and SF pieces. Mark a point 7″ up on the guideline. Connect the corners of the CF and SF piece to that point. Watch point: If that 7″ dart goes above the level of the bottom of your armscye, or above where your CF and SF pieces join, you will want to lower it. This dart should stay below the shoulder area. Check to make sure that both legs of shoulder and waist darts are the same length. Adjust them if needed. 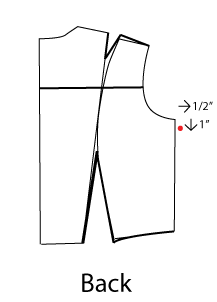 To add ease to the back, mark a point 1″ below bottom of the armscye, and 1/2″ away from the existing side line. 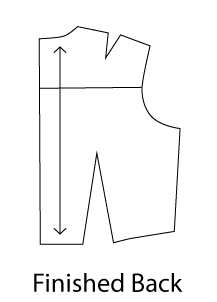 Redraw the botton of the armscye curve and the side line so that they meet this point. Watch points: The upper part of the armscye should not really change. 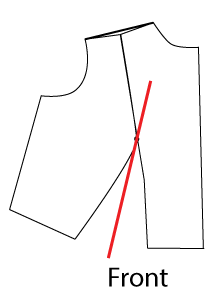 The side line ends at the original waist line. Voila! You have a finished bodice back! Just this once, the front is going to be easier. Oh, and nobody dies. 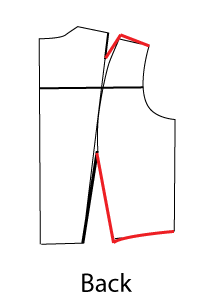 True the shoulder with a straight line from the neck corner to the armscye corner. Drop a point 1″ from the Bust Point along this guide line. 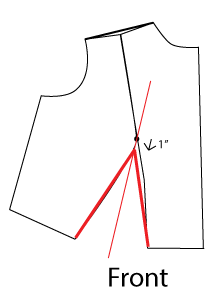 Draw lines connecting both sides of the waist to this point. 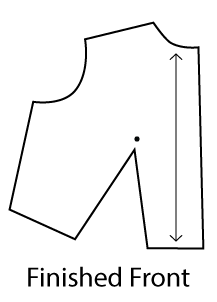 To add ease, mark a point 1″ down from the corner of the armscye and 1/2″ from the side line. That wasn’t all too traumatic, was it?